Today, we had engaging activities and discussions focusing on strategies and challenges of collaboration, focusing on working together as individuals and in teams. First, we re-introduced ourselves by playing another name game. So many new students had arrived in the past 2 days, so we played a game where everyone had to say the name of everyone else in the circle, along with a little dance. In addition to the new students, we had two Peace Corps volunteers, Kris and Brian, who joined us for a few days of professional development. Both of them studied engineering in college in the U.S. and were now serving as math teachers in rural schools in Liberia. To start off the workshops, Sahithya led us off with an engaging game of “Barnga.” Barnga is a way to teach about cultural differences and to facilitate discussion about working with people from different cultures. All the students sat in different groups to play a card game. They could not talk, they could only play the game. Every five minutes, the winners of each group would get up and go to a different table. But unbeknownst to the players, the rules of the game were different at every table. Let the confusion begin! 4. Do what you can to learn the “rules” of each culture. Ask and try to understand why those rules are important to the culture. How can we accept people of a different background into our culture? 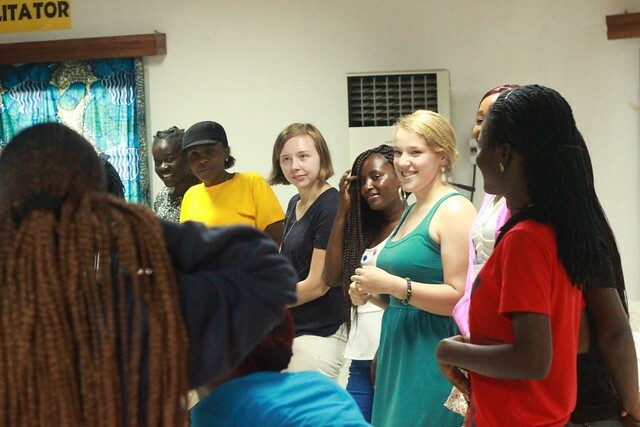 After the game, Sara led off an interactive workshop on cultural differences. 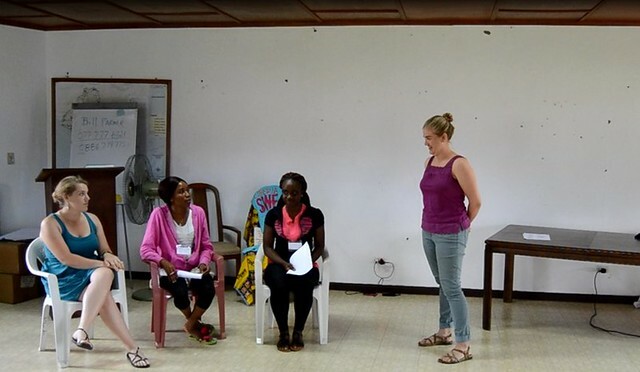 All the students got into small groups to put on skits based on scenarios of everyday life, work and skill. In each scenario, a group had to portray the situation as it might happen in a different culture. For instance, students acted out how people in a masculine culture might interview a prospective applicant for a job, while another group modeled how a feminine culture might conduct an interview for the same job. After each scenario, the group discussed how the scenario might play out in Liberian and American cultures. It was quite interesting to learn about all the different cultural differences, and also to see the similarities. It was important also to see how these cultural difference might influence how camp participants interacted. For instance, although the UM grad students are “in charge,” because American university culture is “low-power distance” we don’t adopt the same authoritative attitude that the students are used to with a professor or teacher in Liberia, which is a “high-power distance” culture. Following the scenarios, we dropped down from the group level discussions about culture to talking about individual identity. We started off by having students describe themselves in 5 words. Everyone put their words on a post-it note, pasted it on a wall, and then as a group we created categories that describe what the students thought defined them as a person. We talked about these categories – appearance, relationships, career– along with standard internationally recognized identity categories, like gender, ethnicity, class, and sexual orientation. In addition to learning more about each other, it was also an opportunity to talk about the concept of privilege. Privilege, in short, is an advantage that an individual has as a result of being a member of a particular group. It is not earned, and usually it is taken for granted. In our discussion, students identified categories in which they were all the same, but also that they did not think about much. These were ability status and sexual orientation. In Liberia, sexual orientation is a contentious issue, especially given the Christian and Muslim majority, but all the students voiced similar thoughts and opinions. 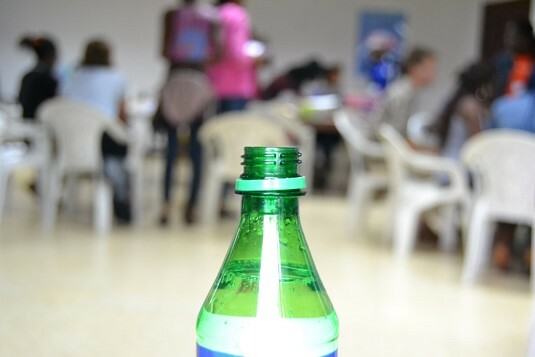 The students also pointed out that although many of them knew a person, sometimes close friends and family, that had a disability, none of them had any physical challenges that made it difficult to participate in everyday activities. The Peace Corps volunteers also pointed out that our students seemed to be much more economically stable and highly education than young people in the communities that they were teaching in, which pointed to different class statuses. To conclude, we thought about how each of our identities enabled us to be successful female engineers, and if there might still be people who are excluded from the opportunities these women had. To wrap up the day, Sahithya introduced our first engineering competition! On Day 3, which was a Saturday the students would work in teams to build and test bottle rockets! The students found out their team members, and were instructed to come back to the classroom at 9am the next morning to get their materials and start working. This was a full day and at the end, we were all absolutely exhausted. BUT, it wasn’t over! In the evening, we celebrated two of the girl’s birthdays. Both were turning 21, and although Liberians usually don’t do much for their birthdays, we threw a big party. Our amazing catering staff (led by Yamah of Monrovia’s Yamah’s Kitchen) made two big cakes, one chocolate and one pineapple upside down cake, and then we danced danced danced all night long to the everyone favorite African jams! Somehow, Gangnam Style ended up in there, and there was a a congo line, and also a runway-style dance-off. Cultural exchange indeed! Check out our Instagram for photos! 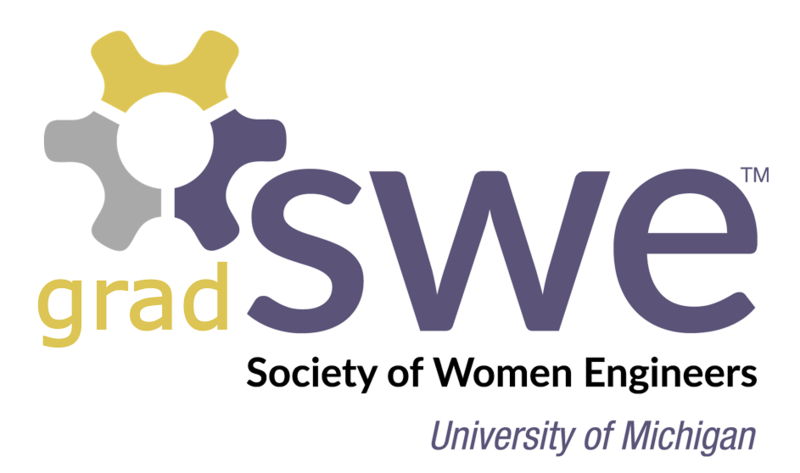 Sara, Liz, Jasmine,Maggie,Jacquline and Sahithya, and the rest of the UM-SWE, we the L-SWE family say a big thanks to you all, for puting Liberia on the World most social network through the LIBERIA SOCIETY OF WOMEN ENGINEERS and to our EDUCATIVE PRESIDENT MISS EDITH TARPLEH Senior student UNIVERSITY OF LIBERIA.